Thank you for the Christmas card. That was very thoughtful. 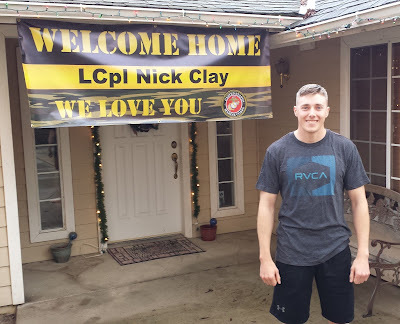 I have attached a picture of my son Nick and the banner you guys made for him. We attached it to our house so it was there when we came home from the airport. As you can tell by his smile, he was thrilled. You guys really came through for me. I can't tell you how impressed I am with your service. And Jayne, you went above and beyond what was expected to get this banner in time for my son's arrival. Thank you so much. Hope your new year is filled with peace and prosperity. You and Banners.com deserve it. Customers for live. Here is the photograph Kevin shared with us. Thank you so much for sharing your picture and your story. If you need a welcome home banner for your loved one, visit our Military Banners page.